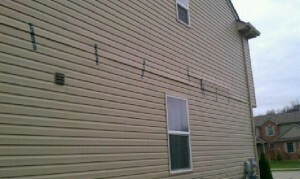 I’ve had some loose siding on my house since sometime last summer. A few weeks back, we got a bit of a wind storm and the rattling siding kept me up most of the night. It’s right behind my bed. I was delaying buying a ladder to get up and look at it and see if I could fix it. With Hurricane Sandy predicted to cause high winds in Michigan, I grew pretty nervous Monday afternoon, so I called Rob to have him take a look at it to see if I needed to leave work to do something about the problem. That for sure held it until I got home.